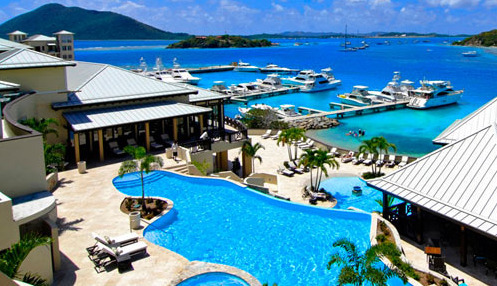 Scrub Island Resort, Spa & Marina, which opened in 2010, on a private island off of Tortola in the British Virgin Islands, recently completed all seven of its Hillside Villas. Chic Family Travels vacationed at Scrub Island in November of 2011 and the villas were not yet complete. However, we had the opportunity to view their location and the on-going construction. They are located on the hillside making them a little less convenient to the marina, beach and restaurants. Nonetheless, these luxurious villas will offer more space for larger families and groups as well as private pools and stunning views. The Scrub Island villas range from two to four bedrooms and offer 3,000 to 6,000 square feet of space with expansive views of the Caribbean Sea and the surrounding islands such as Little Camanoe Island. Each Hillside Villa features large balconies and terraces as well as Subzero, Wolf and Viking appliances, enclosed rain showers and infinity-edged or plunge pools. The interiors of each Hillside Villa at Scrub Island Resort feature local artwork, custom furnishings, king-size beds with luxury linens, natural stone flooring, bamboo ceiling fans and 42-inch flat panel televisions. Large sliding windows and doors when fully open invite the balmy trade winds and display unobstructed views. Each bathroom is grand in size and splendor, with natural stone flooring, granite-top twin-vanity, rainforest showerhead, water closet and a roman tub. Contact Chic Family Travels to reserve a Scrub Island Vacation!